In the never ending battle for better direct booking numbers, hoteliers must find ways to outshine their competition and present a powerful image in the eyes of the consumer. How travelers see and identify your hotel is all based on your marketing strategy. The best canvas for marketing is the internet, and more specifically, your hotel website. Over time, a number of hotels have applied strong tactics to capture the attention of travelers and increase their direct booking stats. Your hotel website’s home page will typically be the traveler’s first interaction with your brand. Since first impressions are important, you want your website to evoke the same feeling as actually staying in your hotel. 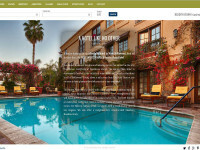 Most successful hotel websites use specific methods to ensure their website is engaging. Below are just a few reasons why some hotel websites are successful. One of the first steps to creating a great hotel website is getting familiar with your audience. There are a number of great research and analytic tools that allow to see what kind of travelers have visited your website. Once you figure this out, you can start creating content that will touch the sensibilities of your target audience. For example, if your usual guests are business travelers, focus your website on the amenities that business travelers would seek. Use this same tactic for any of the traveler demographics: tourists, family travelers, vacationers, Millennials, Baby Boomers, etc. Your audience will trust your hotel brand more if they can relate to your message. You can have the most beautiful website with great pages and all the right information, but if it’s hard for travelers to find what they’re looking for, they will go elsewhere. Things that guests search for most (rooms & availability, rates, amenities, contact) should be easy to locate on your site. Also, each page should have a single focus and structure that would directly speak to the guests’ needs and interest. This kind of engaging content will increase the likelihood of converting an online visitor into a guest. Media is some of the most important content on your website. If your hotel site doesn’t have something to intrigue the customer visually or with useful information, your hotel brand will be interpreted as boring. Establish value when speaking to your guest by giving them the information they seek using professional photos and videos. Using professional looking photos gives potential guests the opportunity to see the beauty of your hotel. Video content is also highly engaging. Featuring virtual tours, user content, and videos involving guests will gives guests the opportunity to experience a walk-through of your hotel and see guests enjoying themselves. Blogs are great ways to keep travelers informed about what’s going on at your hotel and in the surrounding area. Blogs are also a great way to add fresh content to your site, which Google favors. Also, travelers who click on your blogs about events in your area will be taken directly to your hotel’s website where they can book a room for the event they were interested in. Blogs can be posted on any social network which exposes it to more travelers. Great topics to write blogs on are special events, concerts, local attractions, hotel updates like new services and remodels, and much more. Most of the successful hotel websites have these characteristics in their DNA. Your hotel’s website shouldn’t just be “a website;” it should represent your hotel’s story in such a way that would inspire the guest’s expectations and arouse his or her imagination. When travelers enjoy your website you increase the chances of them visiting for longer which is one step closer to getting the cherished direct booking.